The Cherry G86-6240 SPOS Biometric Keyboard is a multifunctional keyboard that integrates UPEK TCS2 TouchChip biometric sensor to save precious space. The G86-6240 SPOS Biometric Keyboard incorporates a biometric reader, touch pad, and MSR into one compact keyboard that is utilized by one USB connection. It features a full QWERTY key layout in a compact 14" length and it's form factor combines maximal space efficiency with uncompromising alphanumeric data entry. The keyboard is also design for rougher environments with IP54 spill and dust resistant design. The G86-6240 SPOS Biometric Keyboard is fully programmable with 28 re-legendable keys for easy layout configuration and quick function calls. 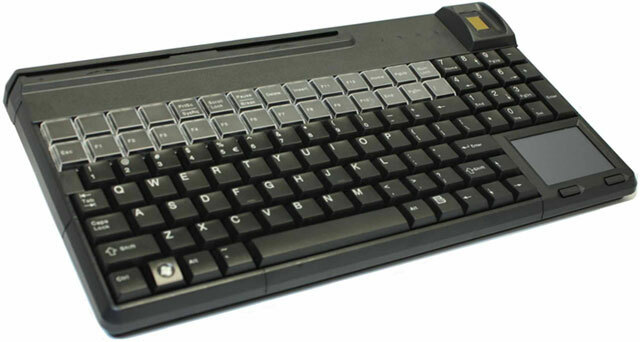 This keyboard is also equipped with a high performance 3-Track magnetic stripe reader with freely programmable headers and terminators for each track. The Cherry G8662460EUADAA is also known as CHE-G8662460EUADAA	.